Think about how you got to where you are today. Years of hard work, dozens of sacrifices, and countless thoughtful decisions went into the process of becoming a highly trained medical professional. You didn't fall into it by accident - acheiving your dream career was the result of careful planning, and you wouldn't be here if this were not your calling in life. After all the work you put into becoming a clinician, it only makes sense to put that same level of meticulous quality and into the professional performance attire you wear to perform your job. Many people are unaware of the advanced and complex thinking that goes into designing clothes. Most people simply go to the store, pick out what seems appropriate in terms of looks and price and make their purchase. While this method of choosing clothing is widely popular, the end result is that the buyer often ends up purchasing clothing that doesn't fit their needs. The function of a garment is something that must always be considered, especially for those who work in the healthcare industry, according to Human Kinetics. The physiological component relates directly to the anatomy of the wearer (shape, size, mass and metabolic activities). It considers a material’s response to external and internal stimuli as well as it considers the ease of wear and removal by the user. The second approach, biomechanical, is a component that looks at the structure, strength and mobility of a garment to ensure appropriate flexibility and strength needed for human purposes. This approach considers unusual postures and movements like crawling, crouching, reaching, climbing and zero-gravity. Ergonomics can be defined as the applied science of designing and arranging aspects of a given garment from the perspective of the wearer, as it takes into account why a user is wearing it and in what environments he or she will be wearing it in. The last approach, and typically the most important approach from a consumer perspective, is the psychological approach, which takes into consideration how human beings think, feel and ultimately act when they are wearing a specific type of garment. These four components dictate how and in what manner a garment is created. From the selection of the material to the fit, pattern making and assembly, every detail of your clothing and its creation has a specific purpose. Bet you never thought so much about why your clothing is the way it is, huh? So the big question is, when there is this much careful thought and purpose that goes into clothing design, why is it that so many people fail consider more aspects of a garment than how it looks or what it costs? Again, this is especially true for healthcare professionals who have jobs that demand quality clothing. Physicians, nurses, pediatricians and others with similar occupations require antibacterial, comfortable, durable and professional looking clothing - yet far too many have been settling for the cheap and ill-fitting. 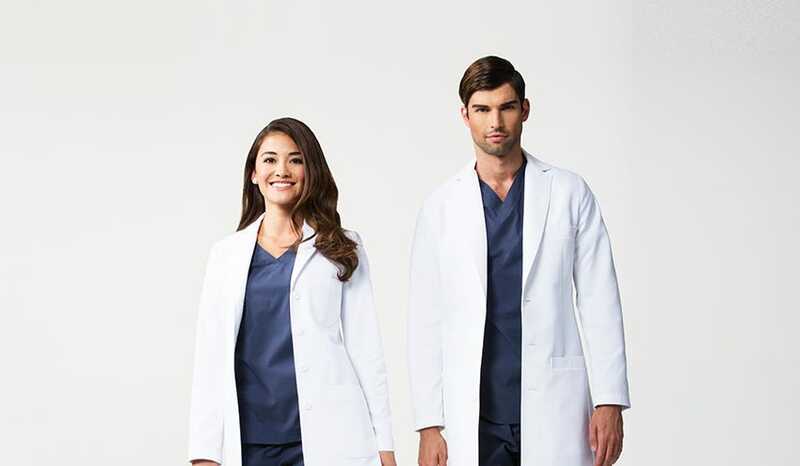 Our designers at Medelita have re-pioneered these four components of efficient functionality for medical wear, including medical lab coats and scrubs for both men and women. From the lapels, to the stitching and fit, we have created unique products that fit different body types to perfection. We are kind of freaks about detail: down to the very fibers we use to create the fabric used in our lab coats and scrubs. We design with the user in mind. While many lab coats and scrubs are abrasive, noisy, smelly and unattractive, Medelita has created garments that are designed for medical professionals, by medical professionals who know what you need from your workwear.